The conventional approach to a cystic lesion in the posterior body of talus involves a trans-malleolar osteotomy. However, a hindfoot arthroscopic technique provides excellent access to the lesion and more significantly, avoids damaging articular cartilage. Department of Orthopaedics, Apollo Gleneagles Hospital, Kolkata,West Bengal, India. Department of Orthopaedic Surgeon, Apollo Gleneagles Hospital, 58, Canal Circular Road, Kolkata – 700054, West Bengal, India. Introduction: True cysts in talar body are extremely rare lesions and their treatment options are yet undefined. The standard of care for a large symptomatic talar bone cyst comprises debridement and bone grafting, often requiring extensive soft tissue dissection, damaging talar cartilage, and sometimes, malleolar osteotomy. Alternatively, an arthroscopic debridement of the cyst cavity with bone grafting may be performed, sparing talar cartilage. Here, we describe such a case of a talar body cyst treated successfully by arthroscopic technique. Case Report: A 12-year-old boy presented with unicameral bone cyst in the body of talus, with fracture of the subchondral bone. Radiological evaluation suggested a simple bone cyst (SBC). Thereafter, posterior ankle arthroscopy was performed and the cyst was approached through posteriortalar process. Debridement of the cystic lesion was done along with curettage, sparing a thin rim of surrounding subchondral bone. The articular cartilage was found intact on both superior and inferior aspects. Subsequently, the defect was filled arthroscopically with cancellous bone graft harvested from the ipsilateral calcaneum through osteochondral autograft transfer system. Conclusion: Outcome of the procedure was assessed clinically as well as radiologically. The histopathological report confirmed the lesion to be a SBC. The child was asymptomatic and resumed sports in school by 6months. The cystic lesion of talus healed completely by 8months. According to the modified Neer classification, the lesion had ‘healed’ radiologically. Keywords: Talar cyst, hindfoot arthroscopic curettage, simple bone cyst, bone graft from calcaneum. True cysts in talar body are extremely rare lesions, and their treatment options are yet undefined. The standard of care for a large symptomatic talar bone cyst comprises debridement and bone grafting, often requiring extensive soft tissue dissection, damaging talar cartilage, and sometimes, malleolar osteotomy. Alternatively, an arthroscopic debridement of the cyst cavity with bone grafting may be performed, sparing talar cartilage. Here, we describe such a case of a talar body cyst treated successfully by arthroscopic technique. A 12-year old schoolboy presented with complaints of insidious-onset pain in the right ankle which progressively increased over 3 months. The pain was causing him to limp and not relieved by conservative measures. His ankle was stiff. Tenderness was localized over the posterior aspect. His AOFAS Ankle-Hindfoot Score was calculated to be 44. 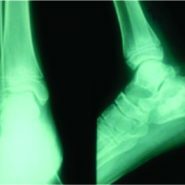 Plain radiographs showed a large cystic lesion involving whole of the body of the talus with preserved ankle and subtalar joint space and contour (Fig. 1) Computed tomography (CT) scan revealed a large unicameral bone cyst in the body of talus measuring 25 mm × 22 mm in the widest anteroposterior and mediolateral diameters, extending from and involving the superior and inferior subchondral bone. There was a pathological fracture in the superior subchondral bone and posterior talar process (Fig. 2). Magnetic resonance imaging confirmed intact articular cartilage surrounding the cyst, no surrounding bone edema, and no extension of lesion beyond the margins of the bone. In summary, there was a large cystic lesion within the body of the talus with associated pathological fracture. The standard treatment prescribed for a cystic lesion of this size would be curettage and bone grafting. However, three issues needed to be addressed in the course of pre-operative planning. 1. From which side to approach this lesion? The lesion is posterior. Hence, ideally a posterior approach would make the procedure simple. 2. How to approach this lesion? An open procedure would most likely injure the articular cartilage which would be a major complication. Hence, an arthroscopic approach was planned. 3. How to fill the large defect after curettage? 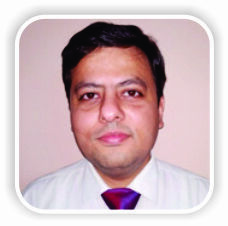 Can adequate and satisfactory bone grafting be done by the arthroscopic approach? With this pre-operative planning, we performed a hindfoot arthroscopic procedure under spinal anesthesia and under image intensifier guidance. The patient was placed prone. Standard posteromedial and posterolateral appoaches were used on either side of tendoachilles (Fig. 3). Both portals were used interchangeably for viewing and instrumentation. Approach to the cyst through the posterior talar process was localized and confirmed under image intensifier with a Kirschner wire (Fig. 3). After clearing the posterior soft tissues, the posterior talar process was visualized and excised and the cyst was exposed. The cyst was found to contain yellowish fluid and surrounded by a membranous margin. The cyst was debrided, and the margins were curetted out (Fig. 4). We discovered significant healthy residual subchondral bone and cartilage, both on the tibiotalar and talocalcaneal aspects. The curetted specimen from the cyst wall was sent for histopathological examination, which was subsequently confirmed as a simple bone cyst (SBC). Now, to fill in the bone defect in the talus, we had the option of using iliac bone graft. However,that procedure would have been significantly more morbid. We decided to use bone graft harvested from the neighboring calcaneum using an osteochondral autograft transfer system. Two plugs of bone were harvested and then prepared into small bits (Fig. 5). 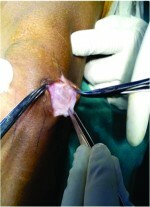 Using the arthroscopy irrigation sleeve, the graft was used to fill the cyst (Fig. 6). Satisfactory fill was achieved. The donor area was filled with bone graft substitutes. The patient was mobilized non-weight bearing for 6 weeks and partial weight bearing ambulation until 3 months. 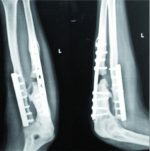 Full weight bearing was allowed only after radiographs showed adequate bone fill and weight bearing was painless. Subsequent post-operative radiographs at 3 and 7 months showed progressive regrowth of new bone (Fig. 7). CT scan obtained at 10months revealed complete bone filling and preservation of joint space without collapse (Fig. 8). As per the modified Neer classification for cyst healing, the lesion had “healed” (Table 1).There was delayed wound healing at bone graft donor site, which healed by about 4 weeks post-operatively with regular dressings alone. Since 6 months post-operative, the child was asymptomatic and had resumed sports in school. At 1 year follow-up, he had shown no deterioration in performance. AOFAS Ankle-Hindfoot Score at 6 and 12 months was 86 and 100, respectively. True cystic lesions of the talus are extremely rare. The differential diagnosis for a cystic lesion in the talus commonly includes aneurysmal bone cyst, SBC, intraosseous ganglion, osteochondral lesion, and chronic infections . Most of the existing literature on talar cysts is related to osteochondral lesions [2, 3, 4]. In addition, the treatment of SBCs by both open and endoscopic methods has been described for long bone lesions with very little literature on talar lesions [5, 6, 7]. Jaffe and Lichtenstein, in 1942, were the first to use the term “solitary unicameral bone cyst.” They presented a concise and clear description of the radiologic and pathologic features of these lesions and classified them into “active” and “latent” cysts. Active cyst resulted from aberrant growth plate function. 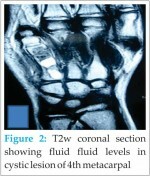 The cyst abutted the growth plate and had the potential to increase in size with progressive thinning of the cortices. Latent cyst had normal growth plate function. The cyst was separated from the growth plate by normal bone. Treatment was more likely to be simpler in such cases . SBCs (or unicameral bone cysts) are primary bone tumors with maximum incidence in the first two decades. They account for 3% of all primary bone tumors in this age group . The lesion has a male preponderance (2:1) . The most commonly involved bones are proximal humerus and femur, accounting for around 94% of the cases. Calcaneum (2%), tibia and fibula (2%), and pelvis are the other bones involved . Talar cysts account for only <0.001% of all cases of unicameral bone cysts . A meta-analysis of 62 articles with a cumulative sample size of 3211 patients with 3217 SBCs summarized the management of SBC’s in general. Injection of methylprednisolone acetate (MPA) alone into the lesion resulted in a healing rate of 77.4%. Instillation of bone marrow aspirate into the lesion provided marginally better results at 77.9% . Concentrated bone marrow may have greater healing potential than unconcentrated bone marrow . However, significantly better outcome was observed when the inner wall was disrupted followed by MPA injection. The healing rate after curettage and bone grafting was 90%, irrespective of whether allograft or autograft was used. Conservative treatment with no active intervention indicated a healing rate of just 64.2% . Open surgical techniques require osteotomy of the medial malleolus to access talar lesions. Very often, the cartilaginous roof of the cyst may be irreversibly damaged while performing proper curettage and bone grafting. Reconstruction of cartilaginous articular surface is difficult, if not impossible. Intralesional arthroscopy provides good visualization of these lesions without malleolar osteotomy or jeopardizing the articular cartilage . 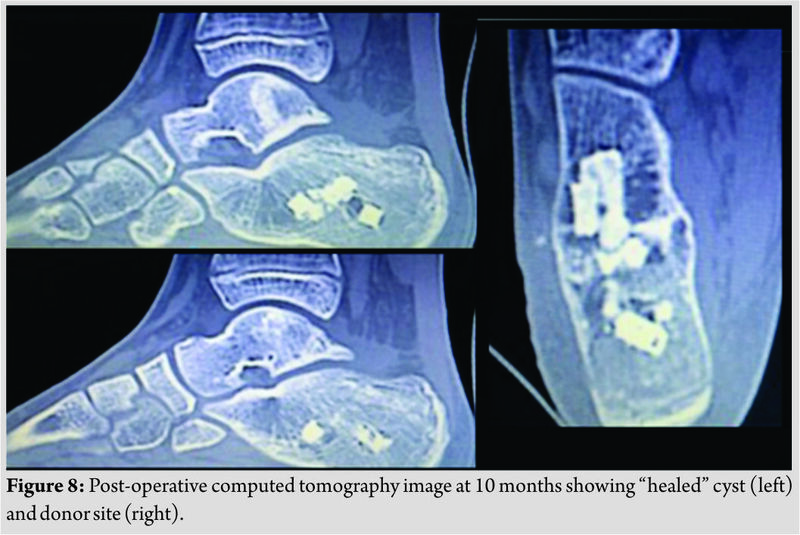 A series of eight cases treated by arthroscopic curettage and bone grafting for large talar dome cysts of different etiologies reported significantly good results with no recurrence or complications during the follow-up period of upto2 years. However, none of these patients were diagnosed to have a SBC. Nevertheless, the author recommended arthroscopic curettage for cystic talar lesions >10mm in size . Talar lesions in the posterior half of the body can be effectively tackled by posterior ankle arthroscopy. However, this approach may be difficult to access anteriortalar body cysts and also lead to excessive bone removal before reaching the anterior cyst. Various osseous portals at the talar neck (extrachondral), the talar dome (chondral), and talar facets (chondral) have been described for the anterior talar cysts . Some talar cystic lesions have been attributed to trauma, most commonly the inversion type of ankle injuries. Initial radiographs in such cases were negative, but changes were reported at about 6 months post-injury. Furthermore, bone grafting might not be necessary for these cases . Arthroscopic curettage for simple calcaneal cysts has been described and compared with open surgical procedure. Although the radiological healing was reported to be statistically insignificant, the overall success rate of the arthroscopic procedure was deemed to be better, considering the fewer complications in that group . The radiological classification based on cyst healing was according to the modified Neer classification system . In another series of six cases, there was associated flexor hallucis longus tendinitis in all cases with large ostrigoni in five of them. 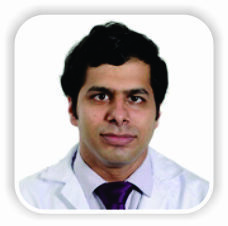 All cases were treated by curettage and bone grafting of the cysts arthroscopically. There was an improvement in median AOFAS score in all cases . Approaching talar body cysts through the posterior talar process cause a minimum damage to articular cartilage with satisfactory results. It can be very well done“arthroscopically” and is probably difficult to do it “open.” Bone from the calcaneum can be used to graft the void. Posterior talar cysts can be addressed arthroscopically. Approaching talar body cysts through the posterior talar process causes minimum damage to articular cartilage with satisfactory results. Curettage and bone grafting can be very well done“arthroscopically” and are probably difficult to do it “open.”Bone from the calcaneum can be used to graft the void. 1. El Shazly O, El Soud MM, Abdelatif NM. Arthroscopic intralesional curettage for large benign talar dome cysts. SICOT J 2015;1:32. 2. McGahan PJ, Pinney SJ. Current concept review: Osteochondral lesions of the talus. Foot Ankle Int 2010;31:90-101. 3. 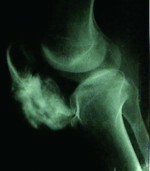 Laffenêtre O. Osteochondral lesions of the talus: Current concept. OrthopTraumatolSurg Res 2010;96:554-66. 4. Scranton PE Jr. McDermott JE. Treatment of type V osteochondral lesions of the talus with ipsilateral knee osteochondral autografts. Foot Ankle Int 2001;22:380-4. 5. Haidar SG, Culliford DJ, Gent ED, Clarke NM. Distance from the growth plate and its relation to the outcome of unicameral bone cyst treatment. J Child Orthop 2011;5:151-6. 6. Cho HS, Oh JH, Kim HS, Kang HG, Lee SH. Unicameral bone cysts: A comparison of injection of steroid and grafting with autologous bone marrow. J Bone Joint Surg Br 2007;89:222-6. 7. Aiba H, Kobayashi M, Waguri-Nagaya Y, Goto H, Mizutani J, Yamada S, et al. Treatment of simple bone cysts using endoscopic curettage: A case series analysis. J OrthopSurg Res 2018;13:168. 8. Kadhim M, Thacker M, Kadhim A, Holmes L Jr. Treatment of unicameral bone cyst: Systematic review and meta analysis. J Child Orthop 2014;8:171-91. 9. du Plessis J, Andronikou S, Hayes M, Mapukata A. Radiological features of simple (unicameral) bone cysts. SA J Radiol 2007;2007:63-4. 10. Hernigou P, Poignard A, Beaujean F, Rouard H. Percutaneous autologous bone-marrow grafting for nonunions. Influence of the number and concentration of progenitor cells. J Bone Joint Surg Am 2005;87:1430-7. 11. Lui TH. Arthroscopic curettage and bone grafting of bone cysts of the talar body. Arthrosc Tech 2017;6:e7-e13. 12. Lui TH. Endoscopic curettage and bone grafting of huge talar bone cyst with preservation of cartilaginous surfaces: Surgical planning. Foot Ankle Surg 2014;20:248-52. 13. Ogilvie-Harris DJ, Sarrosa EA. Arthroscopic treatment of post-traumatic cysts of the talus. Arthroscopy 2000;16:197-201. 14. Yildirim C, Akmaz I, Sahin O, Keklikci K. Simple calcaneal bone cysts: A pilot study comparing open versus endoscopic curettage and grafting. J Bone Joint Surg Br 2011;93:1626-31. 15. Ogut T, Seker A, Ustunkan F. Endoscopic treatment of posteriorly localized talar cysts. Knee Surg Sports TraumatolArthrosc 2011;19:1394-8. 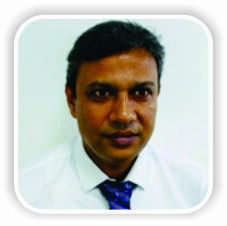 How to Cite This Article: Baliga S, Mallick M N B, Shrivastava C. Cartilage-sparing Arthroscopic Technique for Curettage and Bone Grafting of Cystic Lesion of Talus –-A Case Report. Journal of Orthopaedic Case Reports 2019 Jan-Feb; 9(1): 102-105.